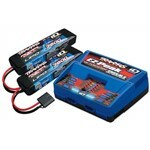 and two Power Cell 7.4V 7600mAh 25C 2S LiPo Batteries. Great pack here with a versatile charger and 2 battery packs that will keep you running for quite a while. No complaints here!